The interview I have translated below comes from Izz ad-Din al-Qassam, a division of the Moroccan muhajireen group Harakat Sham al-Islam, which has played an important role in the ongoing rebel offensive on Latakia and whose founder and leader- Abu Ahmad al-Muhajir/Maghrebi [aka Ibrahim bin Shakaran, the ex-Gitmo detainee and 1990s Afghan jihad veteran] was recently killed. 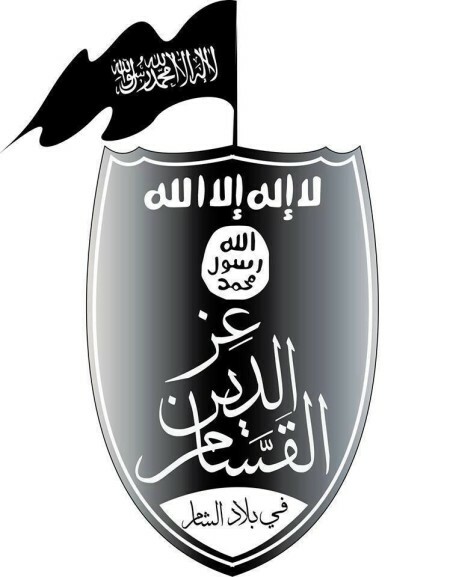 In the infighting between the Islamic State of Iraq and ash-Sham [ISIS] and other factions, Harakat Sham al-Islam officially- as an “independent” group- took an anti-fitna stance, but as one Syrian contact of mine in the group told me, the organization is closer to Jabhat al-Nusra than ISIS, even as all three share the same ideological program of establishing a Khilafa [Caliphate] over the entire world. Ibrahim bin Shakaran’s dead body. 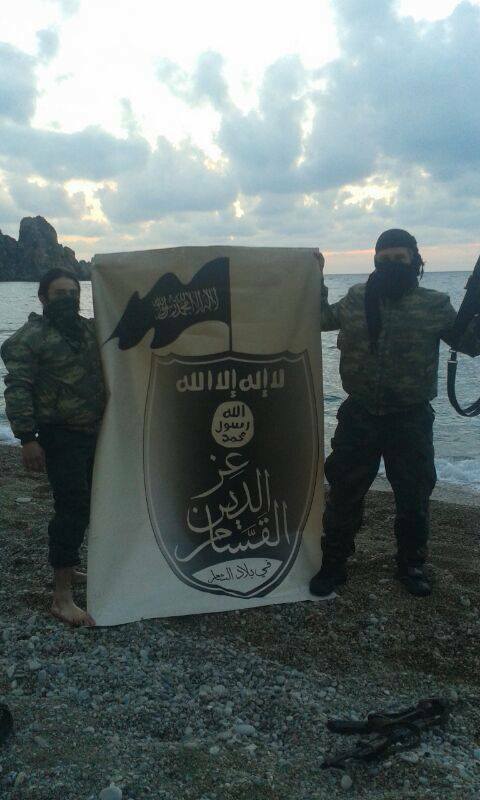 Izz ad-Din al-Qassam division of Harakat Sham al-Islam on the Mediterranean coastline in Latakia. Photo from 26 March. The Muqawama Suriya on the rural peripheries of Kasab. Video footage put out on 6 April. Rebels in Kasab organize evacuation of remaining Armenians to Turkey. Photo via “Islamic Kasab”: a rebel activist group in the town that first claimed rebel recapture today of Burj 45. As of now, the situation remains such that rebels still control the Armenian town of Kasab as regime forces continue to fight on the peripheries of Kasab, while some rebel activists in Kasab just a few hours ago claimed the recapture of Burj [tower] 45, which was a few days ago retaken by regime forces. Meanwhile, rebels have launched rocket and mortar strikes on Latakia city. “Many followers are asking about Burj 45. What is the situation there? – Up to now, the battlelines are witnessing clashes between the mujahideen and Assad’s gangs. We fight them and they us. Why are martyrs upon martyrs falling every day? – This is in the hands of God- these battles and wars. Gunfire flies on every side. So it is inevitable that a number of casualties are reaped from us and from them. And we are but the slain of Jannah and they the slain of Hellfire. Why and how was the amir of Harakat Sham al-Islam martyred? – The heroic, brave mujahid sheikh Ahmad al-Maghrebi was martyred in the battle for the tower, and all attested to his courage and bravery. For alone he was carrying out the assault and firing with his bullets on all the apostates and reaping a number of dead from them. The sheikh was martyred just as we reckon him with God by the bullets of a criminal sniper after the Sheikh had massacred and wounded them. Was Harakat Sham al-Islam leading the battle? – Ahrar ash-Sham held the leadership of the Burj, under their commander, then he was gravely wounded, then leadership was handed over to the Maghrebi commander, so he and his soldiers took up positions on the Burj and fought heroically, with the support of Jabhat al-Nusra and Ansar ash-Sham. Whom have the mujahideen faced in Burj 45? – The mujahideen have faced all the National Defense Force, the Assad army, the militias of Hizb ash-Shaytan, the [Abu] Fadl al-Abbas battalions, and Iranian special forces, but also Chechen soldiers*: your brothers saw them on the Burj. Many of the dogs were masquerading in Afghan clothing and were calling out to brothers: ‘Brother, advance, we are brothers’. God fought them. What has the battle atmosphere been like? – The battle has been ferocious and difficult by all standards, for your brothers have faced states and professional soldiers and it’s not only Bashar’s soldiery. Have other factions besides Sham al-Islam participated in the battle? – Yes, all from Jabhat al-Nusra, Ansar ash-Sham and Sham al-Islam have participated, then supporting factions came eventually. Have some factions really withdrawn and engaged in betrayal? – The withdrawals may be betrayal or tactics, and we only think well of our brothers, for the battle was difficult, the bombing very very strong and the land expansive, but it happened that some ‘Iranians’ engaged in infiltration. 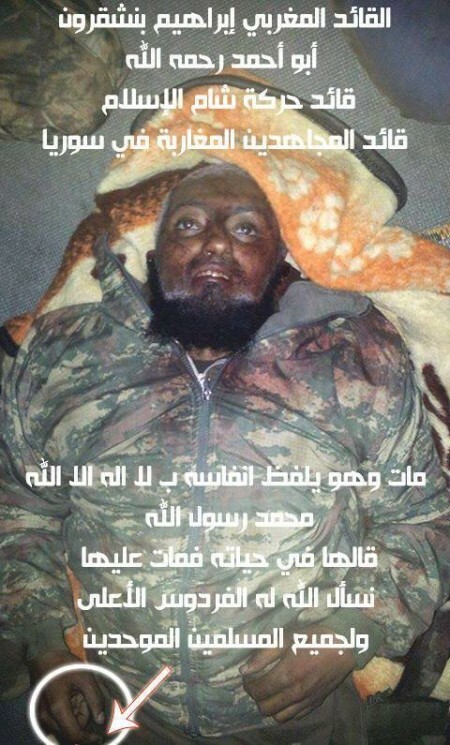 Did the sniper fire or the ‘Sahwa forces of ash-Sham’ kill Abu Ahmad al-Maghrebi? – Abu Ahmad was killed by malicious Iranian sniper-fire, and there was no treachery or betrayal. Whoever says otherwise so his reckoning is with God. How many of Bashar’s soldiers have been killed? How many from the mujahideen? Your brother: Abu Zakariya al-Ansari, participating in the Anfal battle. *- Presumably the mujahid means mercenaries sent by the Russian government to aid the Assad regime. Note also he has forgotten the role of the Muqawama Suriya. While I have yet to see evidence of Iraqi Shi’a or Hezbollah militia participation here, it should be noted that the Muqawama Suriya has met with members of Liwa Abu Fadl al-Abbas. 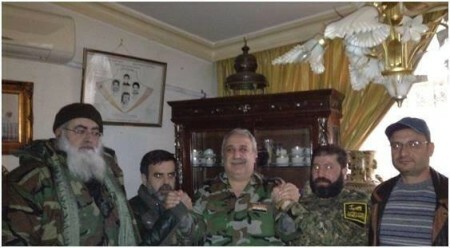 Ali Kayali, leader of the Muqawama Suriya, with Liwa Abu Fadl al-Abbas commanders in Latakia. Photo from January. **- In the context of jihadi discourse, the reference to ‘ansar’ in these battles normally means native fighters. Thus, Harakat Sham al-Islam is primarily Moroccan muhajireen and was founded by such people but has a small native Syrian component that use ‘Ansari’ in their noms de guerre. This Latakia offensive, like the one last summer, is being spearheaded by foreign fighters. This applies to Ansar ash-Sham too, with their Chechen commander in this battle one Abu Musa ash-Shishani. In the video linked to, he denounces Ali Kayali as a “dog” and accuses him of killing Muslim innocents. There you go again, never missing the chance to show an over-the-top outsize image of a dead person among smaller images of live people. I don’t care who it’s a picture of. Deliberately spotlighting and exhibiting a dead human being like that is debasing and insulting to all of humanity. Is it just extreme immaturity, insensitivity and poor judgement? Or is it something worse? It keeps happening and is so obvious, we have to suspect it’s the latter. How would you react if someone close to you was killed and their corpse displayed everywhere for morbid mass viewing? 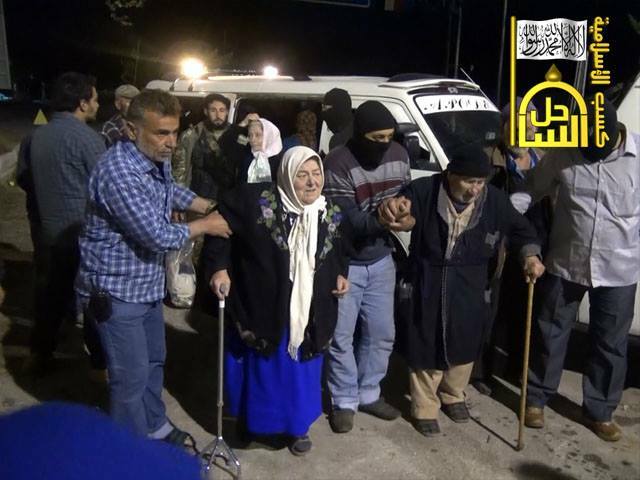 The Syrian opposition continues to control Kessab.